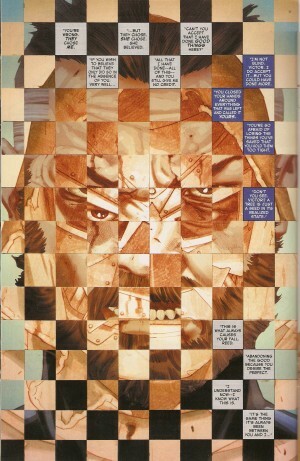 Secret Wars #9 Spoilers & Review: Secret Wars Finale By Jonathan Hickman, Esad Ribić, Ive Svorcina. 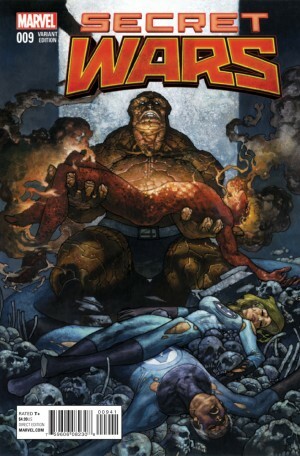 Fantastic Four Marvel Comics Encore!! This is how finality is viewed. 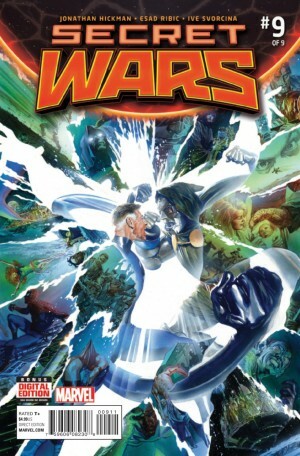 The cover is an accurate depiction of what awaits inside as the nitty-gritty boils down to the two most important men in the making/reshaping of the Marvel Universe. I’m sorry. Did I give away some info?? Um, yeah!! This is why ‘spoilers’ is the proper term. Two men who have years of experience as monarchs stand ready to overthrow one who has been ally as well as opponent. Ugh! Let’s just call him a frenemy. 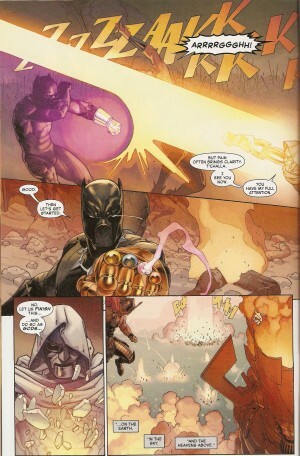 The Black Panther, in his regal stance, deftly uses the Infinity Gauntlet. 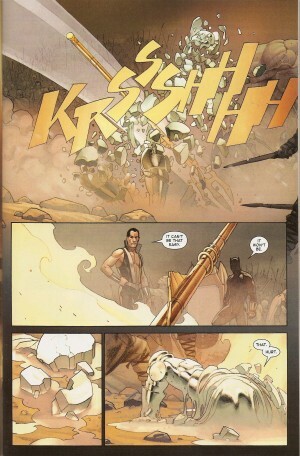 Namor does his part. Let’s just say that the scenario of it being over before it began doesn’t apply here. Universal fail. Doom’s queen-consort is shaken by the sight of Reed Richards. As impossible and improbable as it seems, she remembers the man who is not her husband. Fake-out!! She recalls his image on a screen and is convinced he was one of many who murdered Sheriff Strange. Reed sets her straight by knocking a few pegs off her revered royal. The essence of his character is conveyed in one succinct statement. Good Reed and Evil Incarnate Reed pay a visit to Owen Reece. He is the storage unit for Doom’s omnipotence. 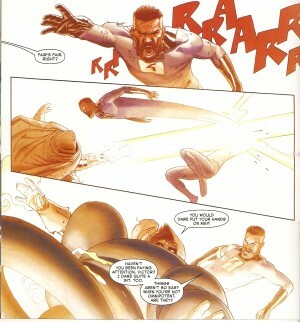 Reed-1610 pulls a fast one on his heroic counterpart. He devolves our beloved scientist to his primal origins. Always be kind to strangers because they will repay that kindness. Owen appreciates the real Reed’s concern for him. Thus, the Maker meets his maker in the Molecule Man as he is made into pepperoni slices. 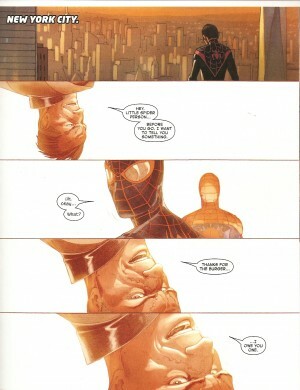 Reed-616 is restored to his splendor and glory. There’s no time to process it all. 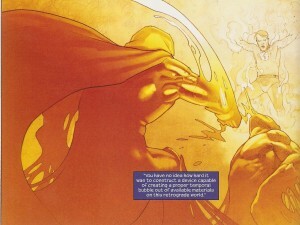 He has to duke it out with Victor Von Doom once and for all. Literally! 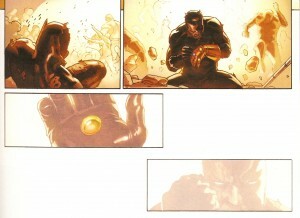 T’Challa loses badly. Even as he lays defeated, he is content that the chaos he organized serves its purpose – a major distraction for the false God Emperor. No amount of power can justify his actions to his beloved. The ultimate throwdown! The battle to repair all the damage. This enmity stretches back [HAH!] five and a half decades!!! It’s always been about ego for VVD and ethics for RR. Reed is enraged that Vic took away his family. No doubt!! I’d be just as irate. The two trade fists and wax philosophical, going in circles. The conflict is resolved when Mr. Fantastic admits that if the tables had turned, he would rectify the artificial reality. Doom achieves his life-long goal – he slays his most hated rival. The End has arrived. Black Panther has the Reality Gem (or is it the Time Gem?) in his palm. With one gaze, he makes a hasty retreat. The absence of light gives way to his return to his beloved domain. The MU proper has is what it was with no evidence of tampering. T’Challa is beaming with pride over his scientists’ development of stellar cartography and the discovery of another solar system. They view a rocket heading for outer space. The Wakandan King explains that it’s the first step for his people to live among the stars. It’s the nation’s Alpha Flight. Two hundred and forty days have passed. Owen thanks Miles for providing him with nourishment. 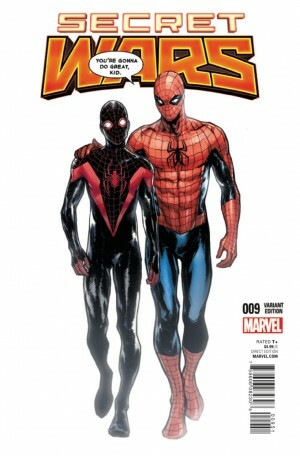 Peter Parker officially welcomes his brother-in-webs to the real deal. The two Spider-Men swing off to seek further adventure. Reed is intact!! Plus, he is reunited with his family. No lie! On an unspecified asteroid/planetoid, new universes are being created. 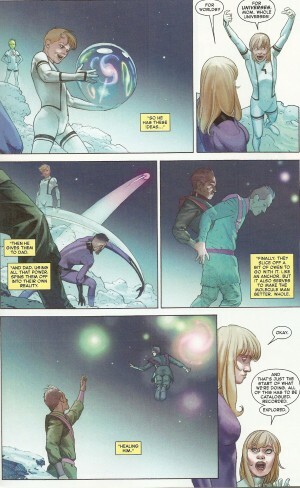 The Future Foundation are in tow for scientific advancement. Owen has accompanied them as well. Franklin wields the ability to reform existence to his liking. The Molecule Man’s essence is delicately siphoned to supplant each new universe. This is beneficial to the matter manipulator. Multiversity at its most ingenious. The Richards are a happy unit once more. Franklin wonders about their career as super-heroes. Daddy dearest tells him that’s on the backburner for the time being. The focus is on science. Wait a minute!! Where are Ben and Johnny??? Reed saved all he could but Sue avers that their stories must continue. Make mine meta-tastic!!! Reed had, and has, the ability to right every wrong. As such, he discards the notion of entropy and eventual nothingness. His beliefs expand, much like his elastic body. 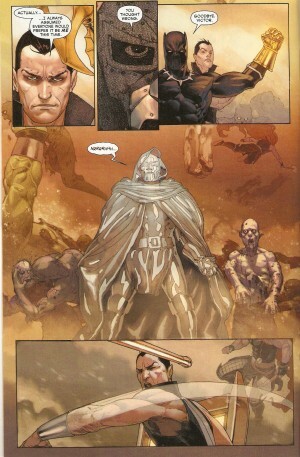 While explaining this to Sue, Doom is seen standing on the turret of his castle. 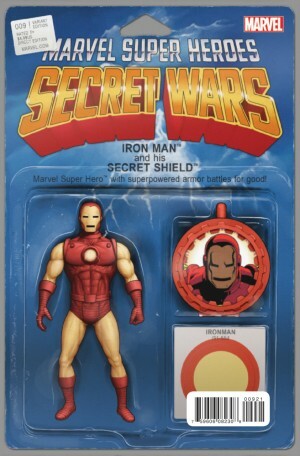 He removes his face plate to reveal his countenance completely devoid of scars. He smiles and laughs. 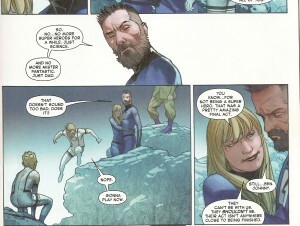 If I’m correct, this is Jonathan Hickman’s send-off. He is most definitely the Reed Richards of this transcendental tale. The shaper of words and worlds has had his final say and performed his final act. The magic has been transferred to someone more worthy. The title itself has a few meanings. 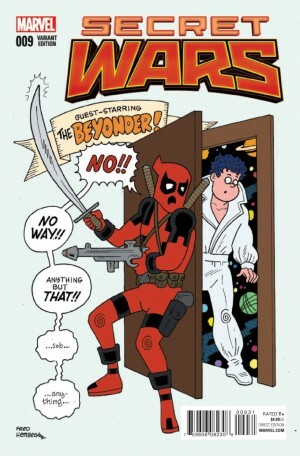 (1) Reed Richards is the new Beyonder. 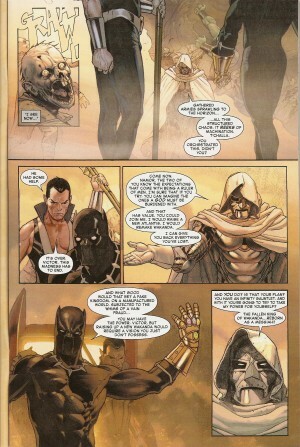 (2) The Marvel Universe has indeed moved forward with its All-New All-Different initiative. 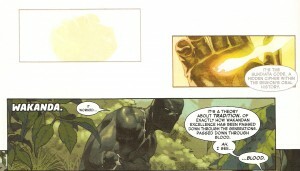 (3) T’Challa is a major scientist in his own right as he oversees extra-terrestrial operations in The ULTIMATES. 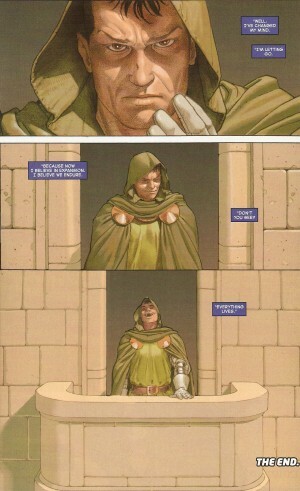 (4) Victor Von Doom may have found true happiness. He has already made handsome face time in INVINCIBLE IRON MAN. (5) The Fantastic Four as we know them are no more. At least not now.Mr. Hickman has realized that the nucleus of the group is the biological family: Reed, Sue, Franklin, and Valeria. Johnny and Ben are not forgotten. We know they have attached themselves to other teams – the Inhumans and the Guardians of the Galaxy. (6) Miles was given a Hail Mary with his mother returning as well as his friends even if he has shifted to the 616. 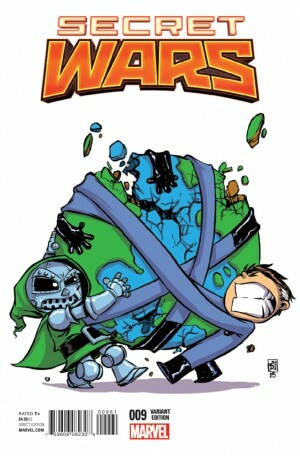 This was presented in the fifth and final issue of ULTIMATE END. My first read of this ninth chapter didn’t faze me much. I took everything at face value. I was still expecting action to the extreme. I wanted the inclusion of all the players. 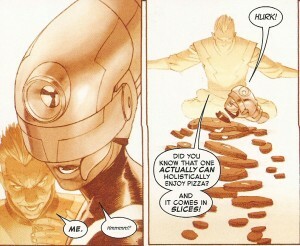 It wasn’t until I looked this over a second time that I realized one obvious thing: Mr. Hickman has a scientific mind. 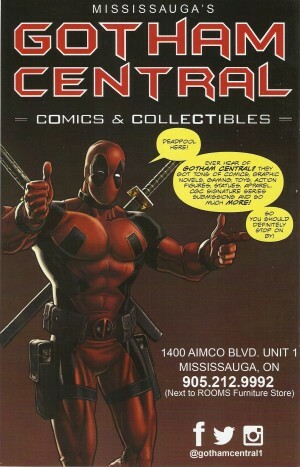 His contributions to Marvel are renowned for their out-there-ness balanced with traditional tropes. 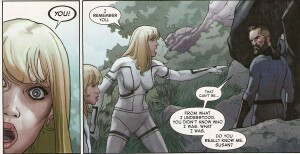 Reed and his kin are absent from the 616 but he is the most important individual in the universe’s existence. He can influence and determine any outcome. Johnny and Ben haven’t forgotten their family ties. It is only a matter of time before this is all resolved. 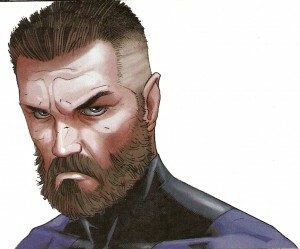 As it stands right now, Reed is akin to the benevolent and far beyond version of his Ultimate Universe namesake. I’m certain his handiwork is remembered, recognized, and appreciated by all. Esad Ribić never faltered. He paid his dues for the entirety of this epic. Doom is ever the vainglorious blowhard. Reed’s new makeover was long overdue. His ruggedness shows his evolution. He is far more confident and determined. 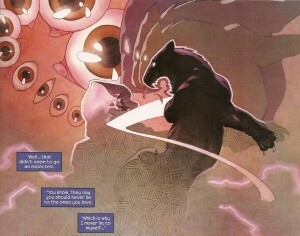 Black Panther prances about exactly like his feline persona. Owen gets a standing ovation. He is the true hero in this story. His upside-down stance was the proper way of viewing the world. The most impressive feat was the multiple tiles separating but trying to incorporate the two polar opposites. Ive Svorcina stuck with light pastels. I wish he hadn’t for the dust-up between the two former friends. I wanted their outfits to be flushed with splashes of blood where appropriate. This was perhaps to emphasize the absolute might at the hands of the supposed emperor. Things become clearer (and then some!) when the four disparate fates unfolded. Clayton Cowles fills in once more. He easily separates the two main stars with green and blue boxes. He makes the battle cacophonous. Reed’s agonizing cry gave me shivers. There you have it. I could continue writing an entire treatise but will spare you. Suffice to say, each character drops at least one memorable line. Since I attained my epiphany, I give this book the same number as the cover for its endless ideas.